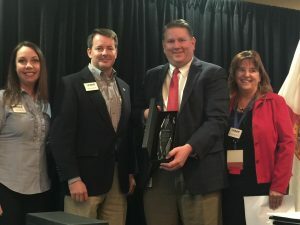 The Kissimmee/Osceola County Chamber of Commerce was recognized as the 2017 Chamber of the Year at the Florida Association of Chamber Professionals annual luncheon on November 15. “The judges noted that (Kissimmee/Osceola County Chamber of Commerce) had developed an impressive long range strategic plan through 2020, their advocacy is stellar. Also, their legislative efforts presented a united front in lobbying Tallahassee on priorities that impact their entire County,” said Nancy Keefer, CEO of Daytona Beach Chamber of Commerce and 2017 FACP Chair. She further commended the Chamber on their community partnerships that have contributed over seven thousand dollars in scholarships to disadvantaged students. “We are humbled and proud. We have a great Chairman, Chris Gent, leading a great board supported by great staff. This award recognizes that we are fulfilling our mission of being Champions for Business and Community,” said John Newstreet, CEO/President of the Kissimmee/Osceola County Chamber of Commerce. Selection was made by a group of peers representing some of the over 50 Chambers of Commerce in the State of Florida.